For the donuts: whisk the flour, baking powder, baking soda, nutmeg, and granulated sugar together in a medium bowl. Set aside. Whisk the milk, yogurt, and egg together until smooth. Add the melted butter and vanilla, whisking until fully combined. Pour the wet ingredients into the dry ingredients and stir until just combined. Do not overmix. The batter will be very thick. Fold in the sprinkles gently to ensure they do not bleed their color. I use these rainbow jimmies and they do not bleed. Spoon the batter into the donut cups—I highly recommend using a large zipped-top bag for ease, as pictured above. Cut a corner off the bottom of the bag and pipe the batter into each donut cup, filling 2 ∕ 3 –3 ∕ 4 of the way full. Bake for 9–10 minutes or until the edges are lightly browned. Allow the donuts to slightly cool before glazing. I find the glaze “sets” easier onto cooled donuts. For the glaze: combine the glaze ingredients in a medium saucepan over low heat. Whisk until the glaze is smooth. Remove from heat and immediately begin dunking the donuts, one by one, into the glaze. I simply dropped each donut into the saucepan and moved it around to coat evenly. 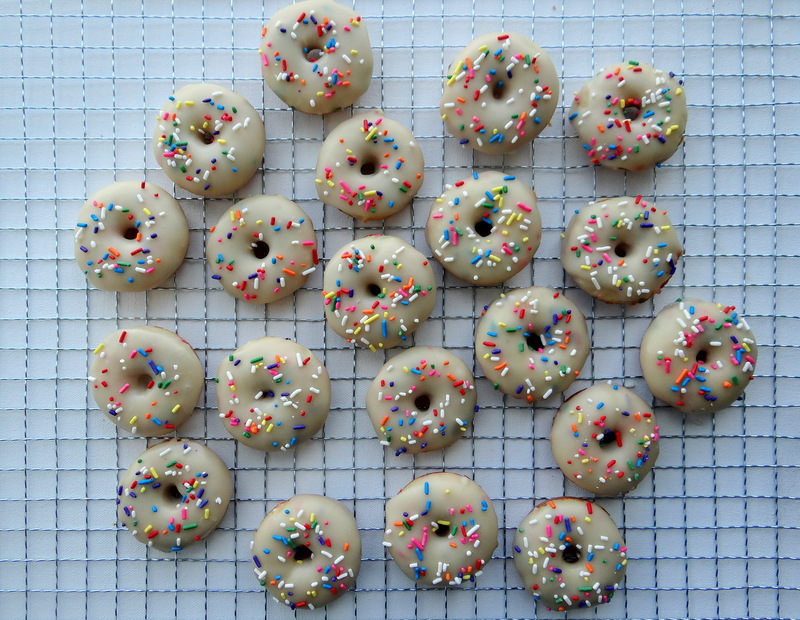 Transfer each donut to a wire rack over a baking sheet to catch the glaze drippings. Take each donut and dunk again if you have enough glaze leftover. Sprinkle with additional sprinkles. Woman, don’t give up on making donuts if you bought a pan for it! Always keep trying! PRACTICE MAKES PERFECT!!!! Next Postthank you Rachael Ray Magazine!